It’s springtime in Wisconsin again. Home gardeners and farmers are busy tending to their beds and fields, relishing the fresh sprouts of flowers, vegetables and crops. It begs the question: What happens to plants as they enter spring? What’s the science that governs the growing season for different plants? 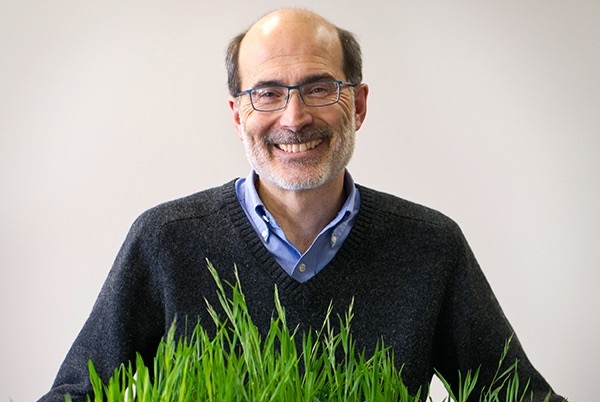 Plant biochemist Rick Amasino, a University of Wisconsin–Madison biochemistry professor who studies the processes that allow plants to produce flowers, shares some answers in this Q&A. Q: How do plants respond to spring? A: There are a wide range of responses. For example, some plants need to be exposed to winter cold to flower in the spring whereas others form spring flowers as a result of being exposed to the decreasing day-lengths of the fall season. Apple and cherry trees are in this latter category—their flowers are actually formed the year before in the fall in buds that become dormant. Then when it gets warm the following spring, everything that’s been crammed into those buds in the fall just unfolds. Other plants, like lilies for example, require exposure to cold in order to flower. When they are growing in the fall, flowering is blocked. But over winter the block is removed and they flower in the spring. The underlying processes for this involves a lot of biochemistry, and that’s what we’ve studied in my lab. Specifically, we study how flowering is blocked in the fall and how exposure to cold results in the removal of this block. The block removal process is known as vernalization; this word is derived from vernal, which means relating to spring. wide range of agricultural research. Photo by Sevie Kenyon. Q: Any more examples of plants that need winter to flower? A: Some common examples are many vegetables we plant in the spring, such as cabbage, carrots, and beets. We don’t usually see carrots, cabbage, or beets flowering because they will not flower until they experience winter and we harvest them before they have a chance to flower. This requirement to go through winter in order to flower is important agriculturally; such plants keep growing without flowering all summer long and therefore the part which we consume can get very large. However, if you left a carrot in the ground after the summer it would flower the next spring and the underground part of the carrot we eat would become shriveled as it provides the nutrients for flowers to form. Q: If it gets warmer earlier, is that a problem? A: One problem is that variations in our climate aren’t across the board. It’s not always going to be, say, five degrees warmer. Instead, climate is likely to be more variable. So, if we have unusually high temperatures late in the winter and cherry blossoms in Door County open, but then we get a blast of cold afterwards, the flowers will be destroyed and fruit cannot form. Q: What’s going on inside the plant that determines whether or not it flowers? A: In the plants we study that require winter, there is a gene encoding a repressor protein that is expressed in the fall that prevents the plant from flowering. Then, over the winter, control of the repressor gene is altered in a way that the repressor is no longer expressed and consequently plants can flower when it gets warm and they resume growth in the spring in the absence of the repressor protein. Q: Why is understanding this process important? A: In basic research like ours, we often don’t know where exactly it’s going, but it often ends up having relevance. Our goal is to understand the biochemical pathways that plants have evolved to flower at certain times of the year. But in crops in which the timing of flowering is important, this research can be applicable; for example, we share our unpublished work with wheat breeders who can translate some of the knowledge into increased efficiency in a breeding program. Also, our work has revealed basic principles of how genes are regulated which has implications for many areas. Another example of applicability, although not directly from our research, was useful for sugar beet farmers, who plant in the spring. A spring cold spell will trigger some of the sugar beets to flower and flowering plants do not produce the part of the beet the farmer harvests. Scientists in Europe modified genes involved in the flowering response to cold and came up with a sugar beet variety that doesn’t flower if it is exposed to cold. Now farmers can plant their beets in the fall rather than the spring to allow them to have a much longer growing season and grow bigger — and they don’t have to worry about the beets flowering. This has significantly increased the yield per acre of sugar beets.